« Top 10 Money-Saving Tips for Newly Engaged Couples ~ How to Bankroll for the Big Day! I'm thrilled by how much Riley loves books, since it's always been one of my main goals to help her develop a lifelong love of reading. There are so many wonderful children's books out there, many of which I remember reading when I was little, that I would like to pass on to Riley. Well, Scholastic has found a new, entertaining way to adapt the classic children's book, Stellaluna, for the big screen. Keep reading to learn more! I reviewed the Stellaluna DVD from Scholastic, which retails for $12.95, but is currently on sale for $9.99 with FREE SHIPPING. Based on the beloved, best-selling children's book by Janell Cannon, the fun-filled animated feature Stellaluna follows a spirited young fruit bat who finds friendship, love and acceptance in the most unexpected places! When the adorable young fruit bat Stellaluna is separated from her mother, she's adopted by a family of birds. Soon, however, she discovers finds that she just can't fit in. Her playmates like to sleep at night; she wants to fly. They whistle and sing; she doesn't even have a beak! But just when it seems like Stellaluna will always be an outsider, she makes an amazing discovery that will help her to cherish the things that make her different. And, she'll also discover that an open mind and an open heart can lead to the greatest gifts of all. Brimming with music, laughter, warmth and excitement, Stellaluna - a story which wonderfully illustrates the very essence of friendship in humorous and touching ways - is sure to capture the hearts of families everywhere! Riley greatly enjoyed this DVD and so did I. If you would like to inspire a child's love of books in a whole new way, then I highly recommend the Stellaluna DVD from Scholastic. 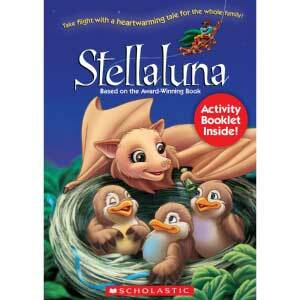 Disclosure: I received the Stellaluna DVD from Scholastic in order to facilitate my review. No other compensation was received. This product review is based on my own personal experiences with this item and is completely honest and objective. Thanks for the great review. I will keep this in mind when my grandson is a little older. They story sounds very cute and teaches an important lesson in life.